When it came time to plan a vacation with my two teenagers this year, I had two missions: 1) make it active and fun because we—Sam, age 18, Hannah, age 15, and I (age, well, whatever)—all like to play and explore, and 2) make it unplugged—no phones, laptops, or iPods for one whole week. 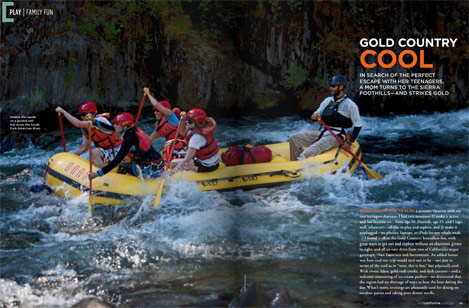 I found it all in the Gold Country: boundless fun, with great ways to get out and explore without an electric gizmo in sight, and all an easy drive from two of California’s major gateways—San Francisco and Sacramento. An added bonus was how cool our trip would turn out to be—not just in terms of the cool as in “wow, this is fun,” but physically cool. With rivers, lakes, god-rush creeks, and dark caverns—and a welcome smattering of ice-cream parlors—we discovered that the region had no shortage of ways to beat the heat during the day. What’s more, evenings are pleasantly cool for dining on outdoor patios and taking post-dinner strolls.